Heyoka is a Windows-only tool, supposedly with some interesting stealth technology. The binary is both the server and the client, and it can tunnel any TCP connection to localhost (a listening VNC, RDP, Squid, or COPSSH server, for example). I tested it without using any of its advanced features, and it works. I used WinXP home in my lab as the server, and Windows 7 on my Macbook as the client. I had to spawn an administrator command shell on Win7 to get it to run. YMMV. DNSCat is a nifty, minimal tool that acts kind of like netcat, only over DNS. For some reason, I couldn't get OS X to play nicely with it, despite the fact that it looked like it wanted to work. Also, the "server" would occasionally bail out to to the shell again, so I often found myself wrapping it in a "while true" one-liner shell script loop on the server end. 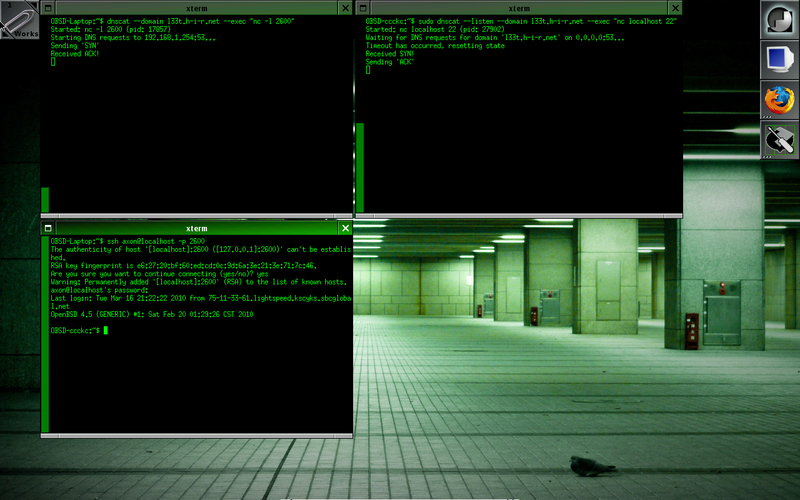 Using the client on OpenBSD seemed to work great, as seen in this screen shot I took. The "server" activity is in the window on the right. Ron gets props for some other fun stuff, too, such as weaponizing DNScat as a metasploit framework payload. This tool, combined with netcat or stunnel, could prove to be quite flexible, I think. I didn't get to play with NSTX, but it looks like a linux-only affair. I don't run Linux on my laptop, so it'd have been difficult to test in the field. Have any others you've used with good results?